Higher input costs have increased the pressure on margins in recent years, with a recent draught in Australia having and additional negative impact. Australian food production has grown steadily over the past couple of years. Key drivers have been population and income growth as well as changes in tastes and preferences. That said, higher input costs have increased pressure on margins in recent years, with a recent draught in Australia having and additional negative impact. 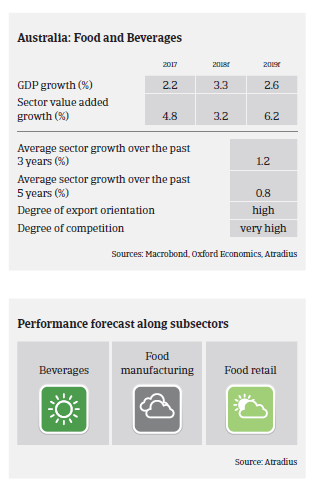 In 2019 food businesses profit margins are expected to decrease further. Price wars are fairly common in the food retail sector, where bigger players compete for market share by pushing prices down. This causes tighter margins for producers. As a consequence mergers and acquisitions are ongoing amongst food producers in order to achieve economies of scale. While the gearing of food businesses is generally high, financing conditions in the industry are good as the agrifood sector is one of the main contributors to GDP in Australia. Banks are generally willing to provide loans to the industry. The number of non-payment notifications in the sector has increased in 2018, and is expected to rise further over the next 6 months. As the drought situation in Australia has put additional pressure on the margins of players across the industry due to higher input costs, many businesses are struggling to breakeven, and some have even incurred losses. That said, the insolvency environment is expected to remain stable, with no major increase expected. Our current underwriting stance remains generally open, while we monitor the future impact of the current draught on the industry. We are very open for the beverages segment, which mainly consists of well-established players with solid financials. We remain open for food retail, despite lower profit margins and fierce competition, as demand will remain high. Our underwriting stance is generally open to neutral for businesses in the dairy segment.Demand is expected to remain high, especially for infant formula milk in Asia (mainly China), but market conditions are volatile. As food traders and wholesalers are very susceptible to commodity price changes and the subsequent impact on margins, we usually have a more conservative strategy on those players. The meat sector is restrictively underwritten due to tight supply, high prices and increased input costs, triggered by the current drought situation on the Australian East coast. We are very restrictive with buyers engaged in pork processing due to a plunge in farm gate prices at the start of 2018 to a level where farmers were struggling to break even. If the adverse weather conditions continue, we expect the performance of buyers active in the meat segment to deteriorate further. While mining-related activity could decline further the prospects for growth in other parts of engineering and non-residential construction are improving. In 2018, respondents in Australia reported a steep increase in DSO and the need for more time to convert B2B invoices into cash.